Nabila Alibhai has worked with governments and multilateral organizations in fragile states to develop rural development, health and emergency preparedness public policies and programs. She has held positions in the Aga Khan Development Network, the United Nations and the International Organization for migration and has worked on projects in Afghanistan, Pakistan, Kenya, Tanzania, the United States and Switzerland. She has a master of public health from Yale University and is trained in conflict resolution. At MIT, she will explore how urban design promotes pluralism and security and how to engage the private sector in urban development. Gabriella Carolini's research focuses on the dynamic relationship between social and fiscal responsibilities in the public sector, exploring the impact of fiscal and administrative reforms on city planning and public health in vulnerable urban and peri-urban communities in the global South. Her current work is based in Mozambique and Brazil, where she studies how international policy mobility and the decentralization of South-South cooperation ultimately translate at the neighborhood level, with a particular interest in community health outcomes. Before coming to MIT, Gabriella was an Assistant Professor in the Edward J. Bloustein School of Planning and Public Policy at Rutgers. She has also worked in various capacities with the UN Millennium Project, UNFPA, UN-HABITAT, Rockefeller Foundation, Center for Sustainable Urban Development at Columbia’s Earth Institute, Oxford Analytica and a private management consultancy focusing on fixed income finance. A native of Queens, NYC, Gabriella spent most of her formative years as a student of/in New York, but also has studied and been an affiliated researcher in universities in Brazil, France, Mozambique, and the UK. She holds a BA in political science from Columbia (1997), a Master of Philosophy in development studies with a concentration on economics from the University of Oxford (2002) and a PhD in urban planning from Columbia (2008), where she was a NSF-IGERT fellow in international development and globalization. Anne Whiston Spirn has an international reputation as the preeminent scholar working at the intersection of landscape architecture and environmental planning. Her first book, The Granite Garden: Urban Nature and Human Design, won the President's Award of Excellence from the American Society of Landscape Architects (ASLA) in 1984, has been translated into two other languages, and remains a standard university text. Her new book, The Language of Landscape, sets out a theory of landscape and aesthetics that takes account of both human interpretive frameworks and natural process. Spirn is credited with playing a seminal role in applying theories and principles of ecological landscape design to urban areas. Her path-breaking scholarly research and writing applies ecological principles to urban settings. Since 1987, she has directed the West Philadelphia Landscape Project (WPLP), in an inner city community near the University of Pennsylvania. The WPLP links landscape design, community development, and urban stormwater management through an action research program integrating research, teaching and community service. Its goals include development of strategic landscape plans to enhance environmental quality, implementation of landscape improvements to stimulate economic development, and mutual strengthening of public school curricula and undergraduate and professional education. The project was cited as a "Model of Best Practice" at a White House summit in March 1999 for forty leading "Scholars and Artists in Public life." Afreen Siddiqi is a Research Scientist in the Engineering Systems Division of MIT. She is currently focused on developing multi-scale models of large engineering systems with a particular focus on investigating the evolution of inter-domain couplings due to sustainability requirements on new large-scale infrastructure. Dr. Siddiqi is also developing analytical tools to address complex socio-technical systems in developing countries and particularly in water systems from an integrated engineering, planning, and management perspective. Dr. Siddiqi received her S.B in Mechanical Engineering in 1999, S.M in Aeronautics and Astronautics in 2001, and PhD in Aeronautics and Astronautics in 2006, all from MIT. She was the recipient of numerous awards and fellowships, including Amelia Earhart Fellowship (2000-01), Richard D. DuPont Fellowship (2003-04), and the inaugural Rene H. Miller Prize (awarded annually for outstanding research) in Systems Engineering (2006). Arif Hasan is a Pakistani architect and planner, activist, teacher, social researcher and writer. He studied architecture at the Oxford Polytechnic, worked in Europe in architect’s offices, and on his return to Karachi in 1968, established an independent practice which slowly evolved into dealing with national and international urban planning and development issues. He has taught at Pakistani and European universities and lectured widely both in the North and the South. His current and previous involvements are listed below. Born in 1943, he migrated with his parents to Karachi in 1947. Hasan studied architecture at Oxford Polytechnic (now Oxford Brookes University), UK from 1960 to 1965. He received his school and college education in Karachi; studied architecture at the Oxford Polytechnic, UK from 1960–1965; worked in architects’ offices in the UK, France and Spain for three years, and returned to Karachi in 1968 to establish his independent practice. This practice slowly evolved into dealing with national and International urban planning and development issues. He has been involved with the Orangi Pilot Project (OPP), Karachi since 1982. In 1989, he founded the Urban Resource Centre (URC) in Karachi of which he is a founder and chairman. He is a recipient of Hilal-i-Imtiaz Pakistan’s highest award for its citizens. Fizzah Sajjad is a second year Master in City Planning student at the Department of Urban Studies and Planning at MIT. She has worked on Community and Business Development with Ansaar Management Company, an affordable housing developer in Pakistan. Her research interests focus on the political economy of mega-projects in the global south, and the politics of land and housing in urban Pakistan. She holds a bachelors degree in Social Sciences from the Lahore University of Management Sciences. Hala Bashir Malik is a second year SMArchS student at the Aga Khan Program for Islamic Architecture. She holds a professional degree in architecture from Beaconhouse National University, Lahore. She has previously worked with the Aga Khan Cultural Service Pakistan on the Lahore Walled City Project. She is also involved in a non-profit organization, Resettling the Indus (RtINDUS), based in Lahore, which focuses on rural development with a strong emphasis on community involvement, sustainable practices and enterprise development. Kamran Asdar Ali is associate professor of anthropology, Middle East Studies and Asian Studies at the University of Texas, Austin. He is the author of Planning the Family in Egypt: New Bodies, New Selves (UT Press, 2002). He is the co-editor of Gendering Urban Space in the Middle East, South Asia and Africa (Palgrave 2008) and Comparing Cities: Middle East and South Asia, both with Martina Rieker, with whom he also coordinates the Shehr Network on Comparative Urban Landscapes. He has published several articles on issues of health and gender in Egypt and on Pakistani politics and popular culture. He previously taught at the University of Rochester (1995-2001) and was a member of the Institute for Advanced Study at Princeton (1998-99). His more recent work has been on ethnic, class and gender issues in Pakistan and is currently finishing a book length manuscript on the social history of the working class movement during Pakistan's early years. Daanish Mustafa obtained his BA in Geography from Middlebury College in Vermont, USA. He worked for two years in Pakistan for the non-profit sector on donor funded social development and environmental preservation projects. He subsequently obtained his MA in Geography from the University of Hawaii-Manoa in 1995 and his Ph.D. from the University of Colorado, Boulder, USA in 2000. He was a visiting assistant professor of geography at George Mason University, and then an assistant professor of Geography, at the University of South Florida, St. Petersburg, before joining the Department of Geography at King’s College, London in 2006. Azra Dawood is a third year Ph.D student. Her research examines the interdisciplinary and transnational impact of American philanthropy and cultural internationalism on architecture and archaeology, in between the two world wars. Specifically, she is interested in the patronage of John D. Rockefeller, Jr.—who was arguably the most prolific American philanthropist in the inter-war period and whose projects spanned the United States, Europe, the Near East and the Far East. Azra is also interested in post/colonial architecture and in the history of architectural movements in the United States, England, and France in the long nineteenth century. She previously graduated from AKPIA’s SMArchS program in 2010. In the gap year between her Masters and Ph.D studies, Azra was the SOM Foundation’s Travel and Research Fellow. She has worked as an architect in New York, Austin, and Karachi for almost ten years, and she has a Bachelor of Architecture from the University of Texas at Austin. Anita M. Weiss received her doctorate in sociology from UC Berkeley in 1983 and is now professor and head of the Department of International Studies at the University of Oregon. She has published extensively on social development, gender issues, and political Islam in Pakistan. Her books include Pathways to Power: the Domestic Politics of South Asia (co-edited with Arjun Guneratne, Rowman & Littlefield, 2014); Development Challenges Confronting Pakistan (co-edited with Saba Gul Khattak, Kumarian Press, 2013); Power and Civil Society in Pakistan (co-edited with Zulfiqar Gilani); Walls Within Walls: Life Histories of Working Women in the Old City of Lahore; and Culture, Class, and Development in Pakistan: The Emergence of an Industrial Bourgeoisie in Punjab. Recent publications include “Crisis and Reconciliation in Swat through the Eyes of Women” in Beyond Swat: History, Society and Economy along the Afghanistan-Pakistan Frontier (edited by Magnus Marsden and Ben Hopkins); Moving Forward with the Legal Empowerment of Women in Pakistan (USIP Special Report 305, 2012); and “Population Growth, Urbanization and Female Literacy” in The Future of Pakistan, edited by Stephen P. Cohen and others. Her current project, Interpreting Islam, Modernity and Women’s Rights in Pakistan (forthcoming; Palgrave Macmillan 2015) analyses how distinct constituencies in Pakistan, including the state, are grappling with articulating their views on women’s rights. Professor Weiss is a member of the editorial board of Globalizations, has been s a member of the Research Advisory Board of the Pakistan National Commission on the Status of Women, and has recently concluded her term as vice president of the American Institute of Pakistan Studies (AIPS). Sharon C. Smith is the Program Head at the Aga Khan Documentation Center at MIT, and Co-Director of Archnet. She earned her PhD from Binghamton University, SUNY, in 2009. Her areas of specialization include Middle Eastern art and architecture, and Early Modern Italian art and architecture. Sharon sits on several boards, including the Middle East Outreach Council (MEOC), and was recently named a Fellow of the Institute, Tangier American Legation Institute for Moroccan Studies (TALIM). In addition, Sharon serves as image editor for Muqarnas: An Annual on the Visual Cultures of the Islamic World. She has presented widely on issues of documentation, digitization, and the dissemination of knowledge, as well as on art historical topics primarily focused on visual and material culture in the Early Modern Mediterranean. Balakrishnan Rajagopal is Associate Professor of Law and Development at the Department of Urban Studies and Planning, and founding Director of the Program on Human Rights and Justice at MIT. He is also the founder of the Displacement Research and Action Network at MIT. He is a leading scholar-activist of human rights and development and is well-known for his critical approach to development planning and the law, and politics of the Third World. He served for many years with the United Nations High Commissioner for Human Rights in Cambodia and received a Royal Award from the King of Cambodia. He has consulted with the World Commission on Dams, UNDP, other UN agencies and international organizations, and leading NGOs on human rights and international legal issues. He is the author of International Law from Below: Development, Social Movements and Third World Resistance (Cambridge: Cambridge University Press, 2003), and Reshaping Justice: International Law and the Third World (Routledge, 2008). Diane Davis is Professor of Urbanism and Development at the Harvard Graduate School of Design. She is the author of Urban Leviathan: Mexico City in the Twentieth Century (Temple University Press 1994; Spanish translation 1999) and Discipline and Development: Middle Classes and Prosperity in East Asia and Latin America (Cambridge University Press, 2004), as well as co-editor of Irregular Armed Forces and their Role in Politics and State Formation (Cambridge University Press, 2003) and Cities and Sovereignty: Identity Politics in Urban Spaces (Indiana University Press, 2011). Her current research focuses on the transformation of cities of the global south, particularly the urban social, spatial, and political conflicts that have emerged in response to globalization, informality, and political or economic violence. Laura A. Ring holds a Ph.D. in Anthropology from the University of Chicago, where she is currently Assistant Southern Asia Librarian. She is author of the book, Zenana: Everyday Peace in a Karachi Apartment Building, published by the Indiana University Press, which is an ethnographic study of a multi-ethnic, middle-class high-rise apartment building in Karachi, Pakistan. Ring argues that peace is the product of a relentless daily labour, much of it carried out in the zenana, or women's space. Everyday rhythms of life in the building are shaped by gender, ethnic and rural/urban tensions, national culture, and competing interpretations of Islam. Women's exchanges between households--visiting, borrowing, helping--and management of male anger are forms of creative labour that regulate and make sense of ethnic differences. Linking psychological senses of "tension" with anthropological views of the social significance of exchange, Ring argues that social-cultural tension is not so much resolved as borne and sustained by women's practices. S. Akbar Zaidi taught economics at the University of Karachi from 1983 to 1996 before becoming a visiting scholar at the University of Oxford (1998) and later a research fellow at the University of Pennsylvania’s Institute for the Advanced Study of India in New Delhi (2002–2003). From 2004 to 2005 he was a visiting professor at SAIS and in 2008 he was a Reagan-Fascell Democracy Fellow at the National Endowment for Democracy. Zaidi’s twelfth book, Military, Civil Society and Democratization in Pakistan, was published by Vanguard Press, Lahore in October 2010. Zaidi was a visiting scholar in the Carnegie Endowment’s South Asia Program and a visiting professor at Columbia University, with a joint appointment in the School of International Public Affairs and MESAAS, the Department of the Middle Eastern, South Asian, and African Studies. His research focuses on development, governance, and political economy in South Asia. James Wescoat conducts research and teaching on Water and Landscape Design in South Asia. Over the past year he co-authored monographs with the National Research Council and World Bank on Delta Waters; Himalayan Glaciers; and Climate Water and Agriculture in the Indus Basin of Pakistan His journal articles addressed hydropower, irrigation, climate change, and Mughal water systems. Jim delivered the Professor M. Athar Ali Memorial Lecture at Aligarh Muslim University. Recent presentations include the American Society for the Advancement of Science, American Society of Landscape Architects, Archaeological Survey of India, Indian Society of Landscape Architects, Indian Council for World Affairs, and Vanderbilt University Sacred Ecology Seminar. He is offering a new course on Water-Conserving Design in Rural Gujarat with the Aga Khan Planning and Building Services, India; advises on Islamic garden design projects with the Aga Khan Trust for Culture; and hazards research with the AKDN Disaster Risk Management Initiative. Nasser Rabbat aims to organize a community of interest that brings together the members of AKPIA group at MIT with colleagues at MIT, Harvard, and the greater Boston area. This objective has informed the plans for the three academic programs he supervises: AKPIA’s “An Evening With” lecture series, the travel grants program , and the postdoctoral visiting scholars programs. Rabbat's most recent books are: Mamluk History Through Architecture: Building, Culture, and Politics in Mamluk Egypt and Syria (London, 2010), which won the British-Kuwait Friendship Society Prize in Middle Eastern Studies, 2011, and an edited book, The Courtyard House between Cultural Reference and Universal Relevance (London, 2010) and al-Mudun al-Mayyita: Durus min Madhih wa-Ru’an li-Mustaqbaliha (The Dead Cities: Lessons from its History and Views on its Future) (Damascus, 2010). A forthcoming book dealing with the heralds and consequences of the "Arab Spring," al-Naqd Iltizaman (Criticism as Commitment), will be published in early 2014 in Beirut. Perween Rahman was born in 1957 in Dhaka, then situated in East Pakistan. She moved to Pakistan as a teenager. She obtained a Bachelor of architecture in 1982 at the Dawood College of Engineering and Technology, and in 1986, a postgraduate diploma in housing, building and urban planning from the Institute of Housing Studies in Rotterdam. She worked at a private architecture firm before being recruited by Akhter Hameed Khan to become Joint Director of the Orangi Pilot Project in 1983, where she managed the housing and sanitation programmes. In 1988, OPP was split in four organisations, and Perween Rahman became director of OPP-RTI (Orangi Pilot Project – Research and Training Institute), managing as well programmes in education, youth training, water supply and secure housing. In 1989, she founded the NGO Urban Resource Centre in Karachi and was also part of the board of Saiban, another NGO dedicated to low-income housing, and the OPP-OCT (Orangi Charitable Trust, the microfinance branch of OPP). She taught at the University of Karachi, NED University, Indus Valley School of Art and Architecture and Dawood College of Engineering and Technology. She was the sister of author and teacher Aquila Ismail. 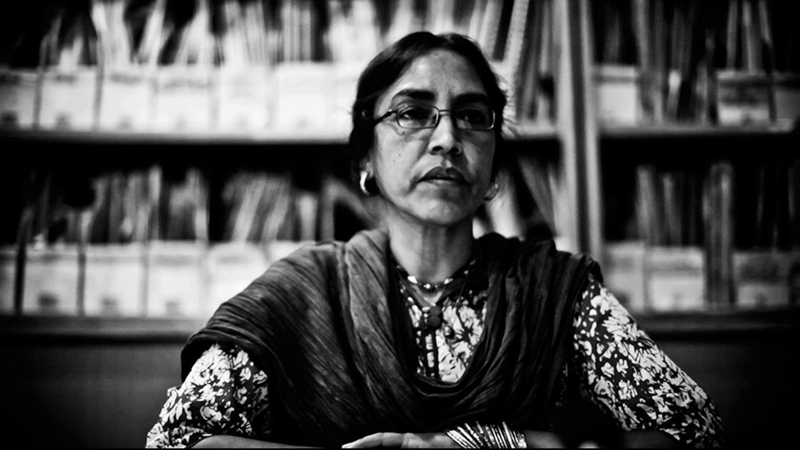 At the time of her death, she was involved in an extensive project involving the documentation of Karachi’s land use, which has been suggested as a possible reason she was fatally targeted allegedly by land-grabbing mafia in the city. The Orangi Pilot Project (OPP) was initiated under the direction of Dr. Akhter Hameed Khan in 1980. Orangi Town is located on the periphery of Karachi, Pakistan. It is a cluster of 113 low income settlements (that were mostly categorized as slums up until 1992), with a population of about 1.5 million. The organization’s biggest success has been of providing social and technical support to neighborhoods in Orangi Town interested in self-help initiatives by demonstrating how to finance, maintain and manage facilities such as sewerage, water supply, schools, clinics, solid waste disposal and security. Its success is reflected in the fact that the OPP model has been adapted in many settlements all over the world; it is now recognized internationally as a model for self-sustained community-led projects.